Ed Riley, the man who has led the restoration of the former Hotel Syracuse, received the Onondaga Historical Association’s OHA Medal Award in recognition for his outstanding and meritorious service to local history, and to the preservation and interpretation of the history of Onondaga County. Riley is owner of the Hotel and has worked closely with OHA to select historic images for reference in restoring the details of the historic hotel, as well as for use in decorating the hotel guest rooms and public spaces. 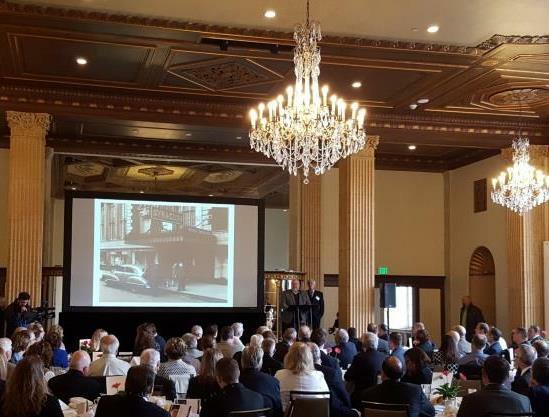 The hotel will also feature a gallery exhibit showcasing its incredible history, as well as historically-inspired gift items in the hotel’s retail shop. The Hotel will official re-open as the Marriott Syracuse Downtown on July 4, 2016. Construction updates, new announcements and information about events and reservations are on the hotel’s website at www.marriottsyracusedowntown.com.